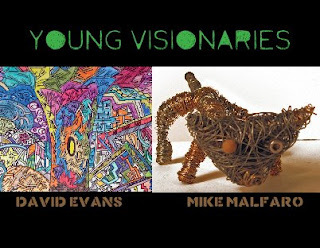 top: Mike Malfaro (far right) at the opening reception to “Young Visionaries” May 12- June 29, 2008 below: Postcard image: “Young Visionaries”. I am a sculptor. My medium is junk. I work with wire, gears, bottle caps and broken bits to make things that are beautiful, or at least interesting to look at. I was not always an artist, though, and this article is not really about me. It is about the man who encouraged and nurtured my talent: George Viener. Viener runs the Outsider Folk Art Gallery in the GoggleWorks Center for the Arts, Reading. It is called the GoggleWorks because the building used to be The Willson Safety Products and General Battery Corp. It was renovated and reopened as GoggleWorks a few years ago. The building still reflects its former use in many ways, including the old vault used as a coat room on the ground floor. My relationship to Viener began when I visited GoggleWorks with my Grandfather. I showed my project, Cactus Jim, to Viener and he liked it a lot. Viener’s gallery is on the top floor. If you wanted to, you could just go straight up in the elevator, but then you would be missing so much. There are dozens of studios rented out by various artists, and a handful are always in. They range from self-taught builders who make things out of motors and irons, to a man on the third floor who makes landscapes out of pressed flowers. Most artists are willing to show you their creations. It is a simply delightful way to spend an afternoon. Viener’s gallery is the largest one. His displays change quite often, as he both buys and sells pieces. He is quite picky, and only displays work that he likes and wouldn’t mind having in his own home. The pieces he likes the most are by self-taught artists, using found materials, such as bottlecaps. Check us out in the FOLK OUT LOUD auction at Material Culture! 11.5.12 Thornton Dial Opening Video+Disaster Relief for the Arts+Slotin Fall Sale Catalog Online! 10.22.12 Weekly New Listings+Slotin Fall Sale Catalog Online!